Western Alaska is an area where no roads lead, accessible only by boat or by plane. It is an area where there are far more caribou than people, where snow dominates the land and ice dominates the seas. It is a large geographical area where the oceans are lifelines for the villages, allowing Crowley’s specially built tugs and barges and highly trained crews to transit and resupply depleted fuel after a long winter of iced-in isolation. 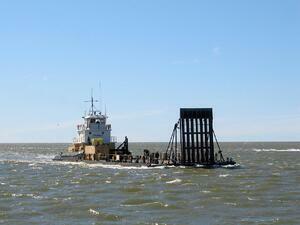 It is in this area that Crowley’s Western Alaska fleet operates. The fleet has 180 days to deliver 50 million gallons of fuel before ice begins forming again, isolating the communities for another winter. 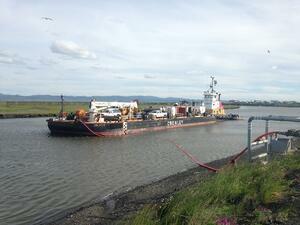 It is day 70 of Crowley’s 180-day fuel delivery season, bringing another summer day—the season is in full progress. The loaded line haul supply vessels have returned from winter layup and are staged in Bristol Bay and the mud coast, ready to lighter Crowley’s Western Alaska fleet. 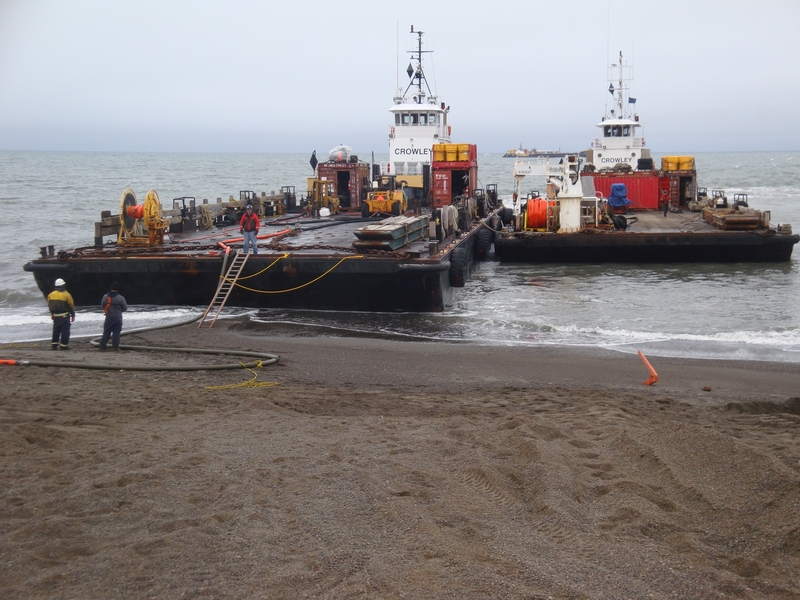 This specialized fleet of shallow draft tugs and combination fuel and cargo barges begin to spread out along the coast in a northerly direction as soon as the ice begins to recede from the Norton Sound, an inlet of the Bering Sea in the western part of the state. Simultaneously, the company’s Arctic barge set in Kotzebue is gearing up and readying as the last of the ice pushes out of the river, allowing the crew to make their first 223-mile trip up the Kobuk River to resupply the villages there. At the same time, a Crowley tug joins the commercial salmon fishermen in Bristol Bay to support the fleet with fuel and supplies while the company’s first major supply of fuel arrives via tanker in the Togiak region, to resupply its tank farm in Bethel. 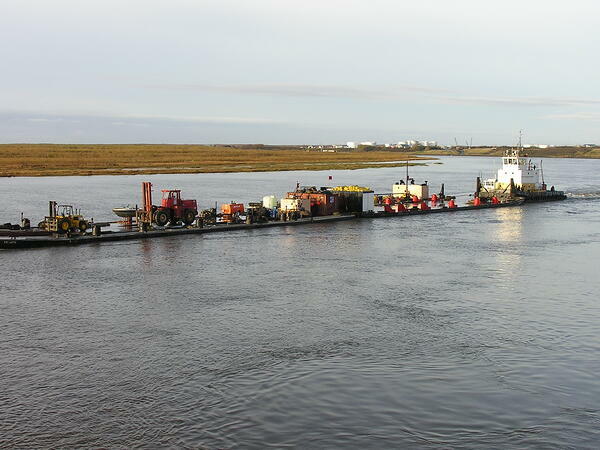 One of Crowley’s shallow-draft coastal tug-and-barge sets is used as a pilot boat to ensure safe transit—making three or four round trips in about three weeks to resupply the tank farm with heating fuel and unleaded gasoline for the Kuskokwim River villages. With time and geography in mind, it’s easy to see the logistical complexities of completing all deliveries to the villages, with some receiving multiple deliveries, ranging from Bristol Bay to Kaktovik in 180 days—all before the rivers freeze up and the weather becomes extreme and dangerous to the vessels and crews. But this is only part of the challenge for the Western Alaska mariners. Another major challenge is the lack of navigational charts, harbor charts, buoys, and soundings for many of the villages where Crowley delivers. Crowley goes where most vessels have a “no go” zone marked on their charts to get the fuel the last 100 feet to the beach. If Crowley can’t deliver it the last 100 feet, the village can’t get the crucial resupply they require. Most of the routes have been handed down from past operators. Current vessel officers (who boast an average of 17 years’ experience operating in western Alaska) constantly update them as river channels change and the coast shifts and erodes. Additionally, Crowley’s vessel crews regularly use a sounding skiff to lay out temporary buoys and create GPS track lines on river crossings or coastal flats to identify where the water levels are low and to navigate difficult spots. Using a sounding skiff is also a good way to identify whether saved routes from the prior year have changed due to ice scouring or channels shifting from big spring runoffs, keeping vessels from unintentionally grounding during a transit. This “local knowledge” is then shared with other Crowley vessels. Other challenges stem from the lack of dock infrastructure and port facilities, resulting in Crowley crews either pushing to the beach or banking with the barge; or in some locations, double anchoring to stay afloat, then floating a hose to pump petroleum products to shore. Year after year, Crowley continues its dance with nature to ensure the company meets the needs of the residents and businesses of Alaska. Crowley takes great pride in its safety focus and in the commitment of its employees—both mariners and those ashore—to lead through innovation and growth in an industry it pioneered more than 65 years ago in the Last Frontier.